We have repeatedly covered the president’s inaccurate description of the diversity visa lottery system as part of speech roundups and in our database of Trump’s false and misleading claims. 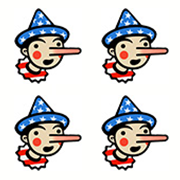 At last count, he has made at least 16 inaccurate claims about the diversity visa lottery, though we are still trying to catch up with all of his remarks in February. Then we saw Trump’s interview with Pirro. Oh my. So here’s the full story, written in the hope the president will read it and perhaps learn something. The Diversity Immigrant Visa Program, as the program is officially called, originally was designed to help the Irish. In 1965, President Lyndon B. Johnson signed the Immigration and Nationality Act of 1965. It was aimed at reuniting families, so applicants who had immediate family living in the United States — children, spouses, siblings, parents — were given priority. This, however, had some unforeseen consequences. Immigrants from Latin American and Asian countries had come to the United States more recently, and they often had immediate family overseas who were prioritized under the new program. Many Europeans, by contrast, had been in the country for decades, so they had fewer close relatives remaining overseas. The change in immigration policy hit the Irish particularly hard. Unlike other European countries, Ireland faced political instability and an economic crisis in the second half of the 20th century. Before 1965, it had been relatively simple for the Irish to immigrate. By the 1980s, as a result, tens of thousands of Irish immigrants came to the United States as tourists or students and overstayed their visas. In 1990, lawmakers, led by then-Rep. Charles E. Schumer (D-N.Y.), pressed for passage of a bill that proposed making a set number of visas available each year to “diversity immigrants” from “low-admission” countries. Despite being couched as a “diversity” action, it was openly pitched as a way to aid the Irish. President George H.W. Bush signed it into law in 1990 as part of a broader immigration package. Today, under the visa lottery system, a computer program managed by a State Department office in Williamsburg, Ky., randomly selects up to 50,000 immigrant visas a year — from nearly 15 million who applied in 2017 — from countries with low rates of immigration to the United States. Thus people from about 20 countries such as Brazil, Canada, China, the Dominican Republic, El Salvador, Haiti, India, Mexico, Nigeria, Pakistan, Peru, Philippines, South Korea, the United Kingdom (except North Ireland) and Vietnam are out of luck because more than 50,000 people from these countries had been admitted during the last five years. The visas are apportioned among six geographic regions, with a maximum of 7 percent available to persons born in any single country. Individuals who apply must have at least a high school diploma (or its equivalent) or two years’ work experience of a type specified by the State Department to be eligible for the program. The selected applicants undergo a background check, interview and medical tests before entering the country, and some applicants undergo an additional in-depth review if they are considered a possible security risk — after which, selected applicants can be deemed ineligible for a visa. “You have a country, they put names in.” Nope, no country submits the names of people for the diversity visa lottery; people who apply are self-selected. “We actually have lottery systems where you go to countries and they do lotteries for who comes into the United States.” Wrong again. The foreign countries do not run their own lottery systems. The United States randomly selects from the millions of people who apply. As noted, a State Department office located in Kentucky, with a workforce of 400 people, manages the process. The Kentucky office receives and processes lottery entries, selects winners, processes winners’ visa applications, and schedules applicant interviews at missions abroad. “They’re not going to put their best people in a lottery. They don’t want to have their good people to leave.” Again, the selection of applicants is not done by other countries. Moreover, the odds of success are so low that even if another country decided who could apply, there would be a less than 1 percent chance of success in getting rid of such people. Asked for an explanation of the president’s comments, a White House official did not address the substance of the question but pointed to two reports. In 2004, the State Department’s deputy inspector general warned that the visa lottery “contains significant threats to national security as hostile intelligence officers, criminals, and terrorists attempt to use it to enter the United States as permanent residents.” This refers to congressional testimony by Anne W. Patterson, who recommended that applications not be accepted from countries listed by State as sponsoring terrorism; that recommendation was not acted on. In the same testimony, Patterson lauded the Kentucky office managing the program and its efforts to root out fraud. A 2007 report from the Government Accountability Office did point to substantial fraud risks within the program and proposed using data to mitigate these risks. However, the State Department at the time disagreed with the report’s findings, saying it already had managed those risks. The same report noted that there could be ‘‘difficulty in verifying identities,” which could have “security-based implications because State’s security checks rely heavily on name-based databases,” something a 2011 report from the House Judiciary Committee suggests could be a national security weakness. The Fact Checker obviously takes no position on the diversity visa program. In addition to possible national-security issues, fraud continues to be a problem, such as some visa winners selling part of their visa to someone who pretends to be their spouse for the purposes of immigrating to the United States. The president clearly dislikes the diversity visa program. Perhaps it has outlived its original purpose. But that’s no excuse for him to consistently misrepresent how it works. Contrary to his repeated claims, countries do not select the applicants and do not run the lottery. Instead, nearly 15 million people from countries with low immigration to the United States apply annually for the slim chance to win an invitation to apply for a green card. A State Department office in Kentucky manages the lottery. It’s located in a pleasant part of the state, near Daniel Boone National Forest, in the heart of Trump country. Perhaps the president should visit it one day and find out how the program really operates. "You know they are not going to have their best people in the lottery, because they’re not going to put their best people in a lottery."